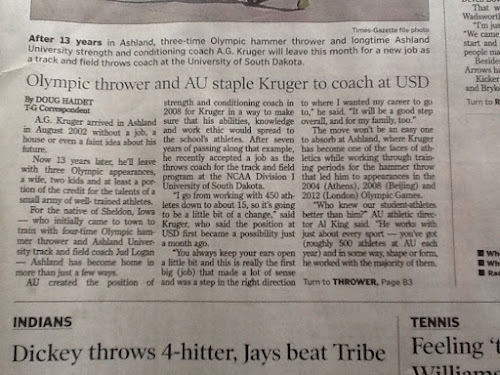 A.G. Kruger, Team USA, 3x Olympian- Hammer Throw : Off to South Dakota! So much has happened since my last post. I have been going going and going nonstop- which is typical for me, but it's time to start with some updates. 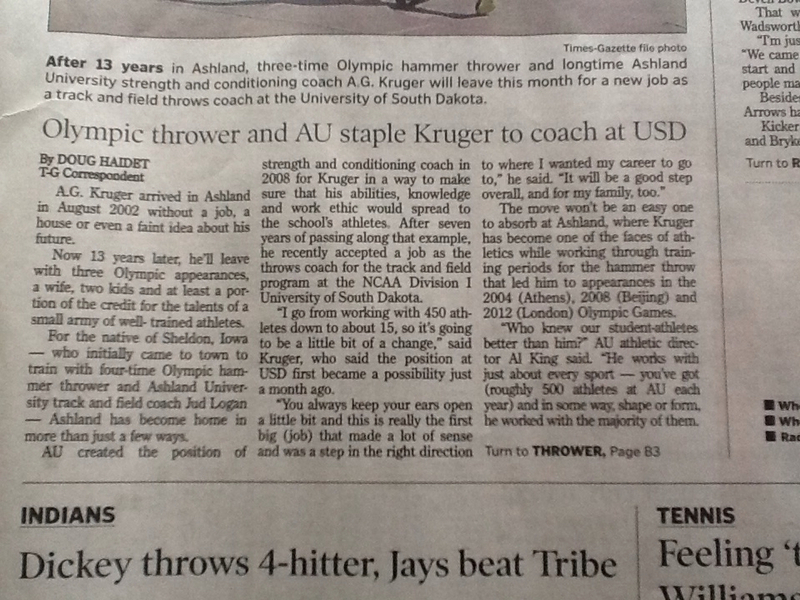 This summer started with USA outdoors in Eugene. My wife, Laura, came out with me and our kids stayed behind with family In Buffalo. Our friends were out there with us and we had a good time. 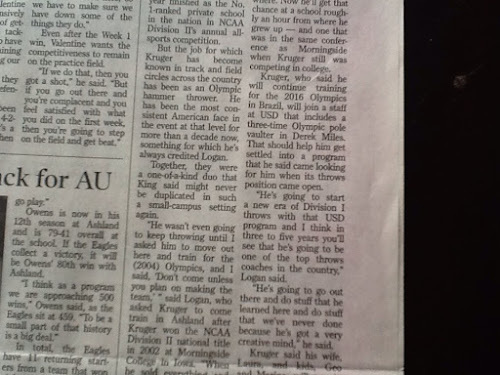 I threw and placed third which means I made the World team because I already had the standard. I'm also very thankful to be continually sponsored by NIKE. They are awesome. I have been working with them for years and I am continually thankful for all they do to assist me. The picture above is in the Nike hospitality suite. The rest of the summer consisted of a family vacation, a couple weddings I was in, enjoying the summertime with my family, and of course... Summer workouts with football athletes... Which they were obviously thrilled to do. 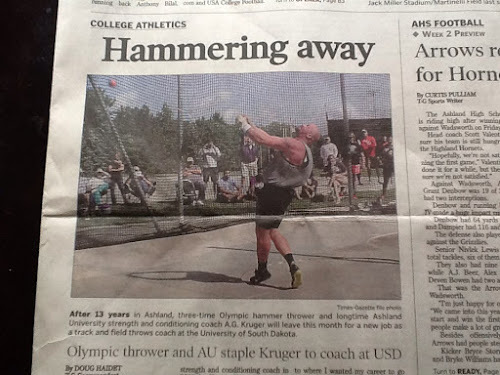 But towards the end of the summer, opportunities started to present themselves for me professionally and the next thing I know I am interviewing for the Throws Coach position at the University of South Dakota (USD)... Which I end up getting, as you might know. Side note: I'm familiar with the area since I'm a Morningside grad and it is only 30 miles away. Plus I grew up about 1.5 hrs from USD. The campus is welcoming, comfortable and growing... With the current construction and addition to the Dakota Dome along with a new outdoor track... It will be very exciting. I'm looking forward to seeing the athletes and getting started. The other coaches are welcoming and I think we will make a great team. Then in mid August I go to Worlds In China. More about that later, but overall my trip went well. I competed in the same facilities for the Beijing Olympic Games so I was familiar with what to expect. Now I'm back at home briefly and I will head out to South Dakota after caring for a minor surgery, help take care of some things at home, and start transitioning. I have already ended me time at Ashland University... Said my good byes, farewell parties, gathered my things, and handed in my keys... Which felt very weird because I have been part of this University for so long. I started my adulthood here. I gathered my Olympic uniforms which have been on display (top shelf). But in yesterday's Ashland Times Gazette newspaper, Doug wrote an awesome article which is 100% spot on. 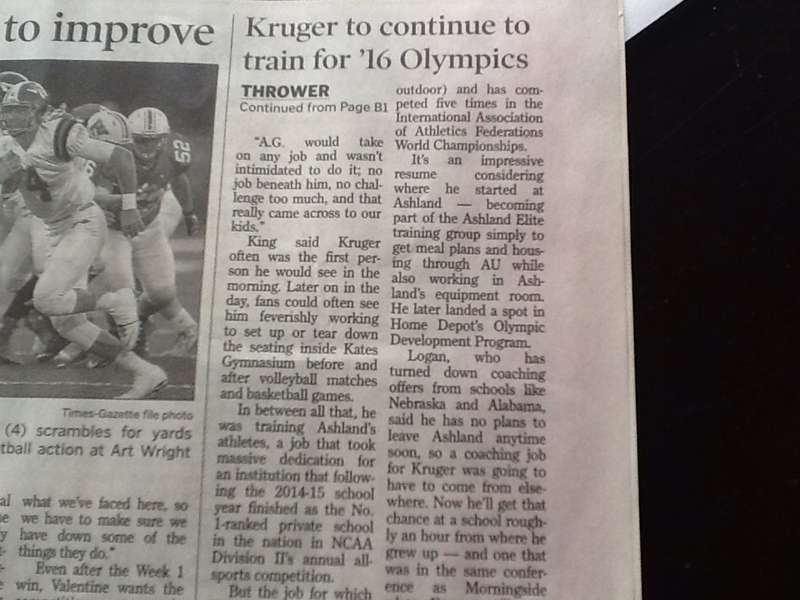 I am very thankful for the comments from Al King and Jud Logan. Those mean a lot to me. 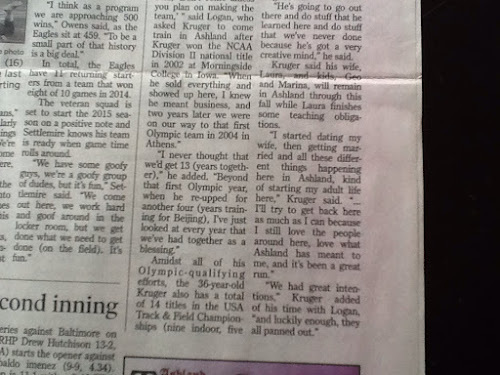 If you are not local to Ashland or you don't have an online subscription to the newspaper, I included the article in pictures below. (Sorry, the second page is a little choppy to read because it's structured vertically). So many thanks to so many people. We will soon start a new chapter at the University of South Dakota! 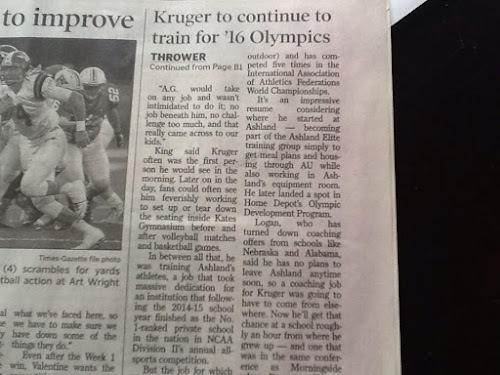 This blog features my athletic achievements, personal posts, pictures, etc, for those interested in following my journey.